CBD is the short form term for cannabinoids which are found in the medicinal hemp plant. There are over 100 different cannabinoids in one hemp plant, all of which have health properties. Aside from the cannabinoids the hemp plant also contains important compounds called terpenes (also found in other herbs as well as fruits) which determine the taste and the smell of the plant and its oils. Terpenes are also medicinal and work synergistically with the cannabinoids to enhance their health benefits. It is the cannabinoids and the terpenes together that give the hemp plant its health properties for so many different health conditions. It has been discovered that ALL people and animals (with the exception of insects) have an endocannaboid system throughout the body which provide receptors for these medicinal compounds. This indicates that the body has an innate ability to process, metabolize, and utilize cannabis. And, it means that CBD oil has the potential to help many different body systems and organs including the digestive system, cardiovascular health, the immune system, the musculo-skeletal system, and the brain and nervous system. CBD Oil should not be confused with marijuana. Even though they are both derived from the Cannabis plant they are different species of the same plant. Medicine produced from Cannabis indica plants have higher CBD content and lower tetrahydrocannabinol (THC). Medicine produced from Cannabis sativa plants have lower CBD and higher THC content. THC is the compound found in marijuana which is the ingredient that gets the user “high”. 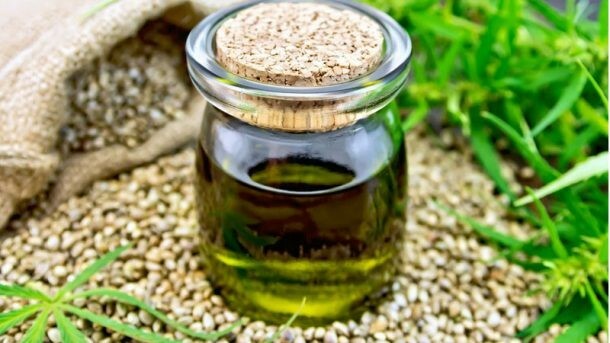 Hemp oil and seeds have been readily available for many years and are harvested from industrial (not medicinal) hemp which contains no CBD’s or medicinal properties. However, they are used for their nutritional benefits. The seeds are the most nutritious part of the plant and they are high in protein, various minerals, and healthy fats. Hemp seeds and their oils are considered to be the perfect balance of omega-3 (linolenic acid) and omega-6 (linoleic acid). This is important since most processed food and many vegetable oils contain too much omega-6 causing inflammation and immune problems. For the nutritional benefits as discussed above add hemp oil, fibre, or seeds to the diet. For specific health benefits use the Holy Gold CBD Oil. CBD Oil contains cannabinoids and terpenes and has many health properties but without the psychoactive “high”. CBD Oil is therefore very safe with little risk of side effects. Products that contain THC can cause adverse symptoms in some people, such as changes in mood, impaired memory, increased hunger, anxiety, paranoia, hallucinations, or other changes in brain chemistry. Fortunately, the industry standard limits the THC content in all CBD oil products to less than .3% THC. This minimal amount of THC is processed before it can be absorbed making the CBD, including the Holy Gold CBD Oil, very safe. Which Health Conditions Can Holy Gold CBD Oil Be Used For? CBD Oil can safely be used for people who are afflicted with pain, inflammation, stiffness, poor digestion, anxiety, and chronic stress. It therefore has a beneficial effect on high stress levels, chronic illness, sore joints or muscles, and various immune conditions. Why Is the Holy Gold CBD Oil a Good Choice? My approach to natural and intuitive health care over 25 years is very holistic whereby I have always used plant-based medicines as part of a complete healing program. The decision to offer CBD oil is not based on trends but is based on extensive knowledge and experience with herbs and the value that they can bring to improving the lives of so many people. 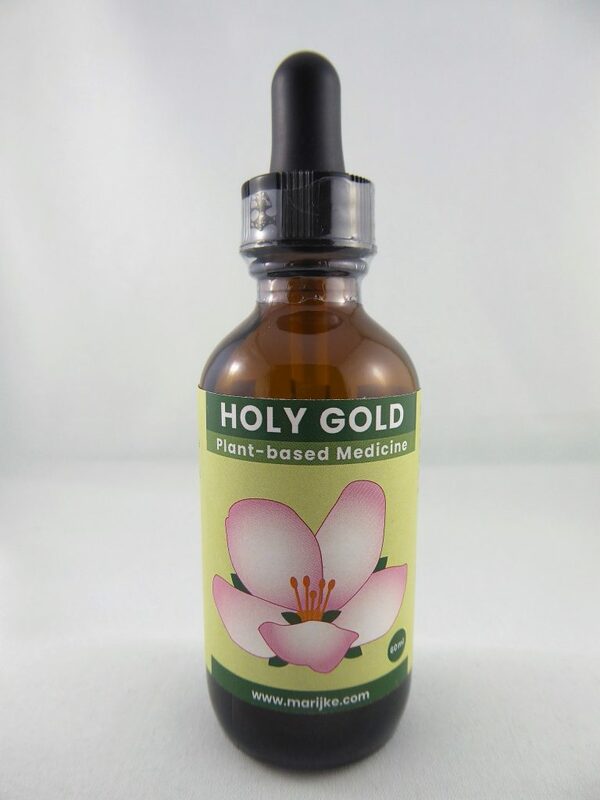 The Holy Gold is a high-quality and trusted product with a strong healing vibe. Holy Gold uses 100% of the whole plant to extract the oil in order to ensure that all of the synergistic healing effects are intact. The oils are extracted from organic hemp plants. In contrast to a cannabis tincture where the active ingredients are dissolved in alcohol, the oil extracts are more potent and much richer resulting in a superior product. It is in a carrier oil of organic and clarified coconut oil containing health promoting medium chain fatty acids. How Much Holy Gold CBD Oil Should You Take? The Holy Gold CBD Oil is a 15% concentrate meaning that one ml (20 drops) contains 15 mg. Generally, the more acute or intense the symptoms are the higher the dosage may be required. The general range for people is from 3 – 20 mg daily. Children: Give 1-2 drops (.75 – 1.5 mg) once or twice daily. Always start with the lowest dosage and increase gradually if required. Adult Beginners: Take 3-6 drops (2.25 – 4.5 mg) once or twice daily. Adults: If required for optimum results gradually increase the dosage to 8-12 drops (6-9 mg) once or twice daily. Dogs, Cats, and Horses: Please click on the link for CBD Oil for animals. What Can You Expect From Taking Holy Gold CBD Oil? CBD oil has been used for many years on both people and animals. It has proven itself as safe and effective for a variety of ailments and can be used for people of all ages. To give yourself the benefits of Holy Gold CBD Oil visit the store and purchase yours today.